← MERS: DYING A SLOW, PAINFUL DEATH? “What we see is a startling trend: Modern students have to work as much as 6x longer to pay for college than 30 years ago. Given the reports that a growing number of college students are working minimum wage jobs, this spells serious trouble for any student who hopes to work their way through college without any additional support. Now, this post is meant to highlight what is but one–albeit a particularly egregious–by-product of financialization that has consumed the productive economy and brought the non-productive economy, i.e., banks, to the fore. Indeed, note Olson’s baseline date–1979, not yet a decade after Nixon closed the gold window. As Olson notes, it’s difficult to pay for college with unless you work full-time and go to school full-time, which is impossible. It’s impossible because if one went to college from say, 8-noon Mon.-Fri. and then worked 1 p.m.-9 p.m. Mon.-Fri., when does one do one’s papers or read one’s books? Well, the 3-4 hour window between going to bed at midnight or 1 a.m., some wags might say. That 3-4 hour window, of course, has to be shared with other necessary tasks, such as traveling back home from the work place, eating, washing clothes, cleaning house, showering, etc. 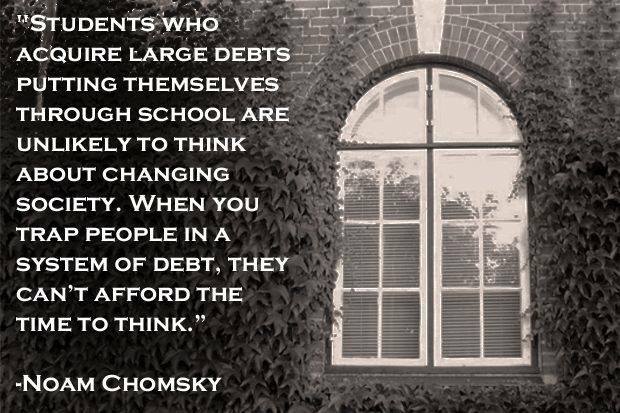 At any rate, the point is not really about college–it’s about things that used to be affordable are not any more, and that’s they way The Financial System likes it–the more non-dischargeable student loans, the better! This entry was posted in "supply and demand", Debt, Debt Slavery, fiat currency, Financial Terrorism, petrodollar, Redistribution, Rent-seeking, Rentier, Wages, Wealth transfer and tagged 1971, bubble, college, financialization, Michigan State, minimum wage, Nixon Shock, rent-seeking, student loans, work. Bookmark the permalink.